I have been so excited for today to hop with my Hero Arts friends and celebrate their new summer release that is now available for all to see in the Hero Arts online store! I think it’s STELLAR that you dropped by to see me! I have several cards to share with you… it’s been super busy around here, but I could not stop stamping! This is such a fun hop to celebrate the new catalog! Lots of great talent and somewhere along the hop, there are three $25 shopping sprees to be given away! Cool? Just leave a comment below and tell me about your favorite new Hero Arts project that you’ve seen (here on my blog or from one of my hopping friends!) Comments will close on Sunday, May 15th at 11:59pm PT and we’ll announce a winner the following week! My first card above showcases a new Hero Arts stamp and die set called Hipster at Heart! I was sorting boxes from storage (from our move last year…sigh) over the weekend, and I found oodles of CDs and cassette tapes that needed to go… what to do? keep? toss? My husband also has throwback vinyl that he refuses to let go of… never mind that we’ve no way to play said vinyl… or cassette tape. STELLAR! I paired the album, notes, arrow and stellar sentiment from Hipster at Heart with some bright Orange Fizz, Sno Cone and Ripe Raspberry MFT inks and a scrap of patterned paper. Super fun! My second card also features Hipster at Heart – Memento London Fog and Cantalope inks with a bit of washi tape and twine. Fun and easy! Next up, a card that I love … This is a close up so that you can see the stamped detail and the airbrushed die cut love. I cut the die cut from white cardstock and then airbrushed with Copic Markers for a fading pink accent. The stamps and die cut are from a small set called Love Stamp & Cut. Love the versatility. Here’s my full card anchored with a bit of Lawn Fawn plaid paper and a few heart sequins … love. Finally, I was so super excited to see the new destination series stamps! We have some beautiful cities in this country, and this one celebrates a favorite Destination: NEW YORK CITY! This skyline is so cute, easy to color – and even though I’ve cropped it here to make room in my polaroid frame for the Chrysler building, this stamp contains the new Freedom Tower on the left side of the skyline! My husband and I were in New York this same week of May in 2013 when they placed the spire at the top. It was awesome to see! I colored NYC with Copic Markers and slipped the cityscape under neath the polaroid cut frame, and then I added a camera and sentiment from Hipster at Heart! So fun! Thank you so much for stopping by to visit me today! I’ve had a ton of fun! I know there are lots of paper pretties for you to see, and don’t forget the shopping sprees! There will be three winners from somewhere along the hop – just comment before midnight on Sunday, May 15th to be eligible! This entry was posted in Hero Arts. Bookmark the permalink. Ha! Your hipster card made me giggle! Great creations as always Lori…hugs! ALL of your cards are absolutely wonderful! Great cards, I liked them all! Wonderful job! I think that “Sending you Love” card is my favorite, so pretty. TFS! How fun are those hipster stamps?! I also LOVE the love card too… because, I like making sweet cards. Thanks for the creations and sharing! Hero Arts has a lot of fun stuff this summer! I absolutely love the destination stamp and what you did with it, but my favorite has to be that gorgeous “Love” card…so feminine and pretty. Thanks for sharing your great creations with us, Lori! New York card is darling! Love the cards and I love this release! What fun cards! Love the colors! i’m super excited for the stencils! Your cards are by far my favorite of this hop!!!!! All of the designers in the hop have such wonderful projects using the new products – I really don’t have a favorite. Your cards are fabulous, Lori! Back in my day! Fun! What a fun bunch of cards! Great cards, you were a busy bee, lol. Love all the great details. Thanks for sharing and inspiring. Wonderful cards. Sending Love is so lovely especially. Your cards are little works of art–love them!!!! Love the New York card – the sequins and different elements on the card are just genius!! Great bunch of cards, love the NY! Love the airbrushing of the love sentiment. My favorite has to be the love card. I also like the new Seattle stamp they came out with (even though I am in Portland). Great cards but I love the hipster card the most! Very nice cards and the records bring back memories. I love to travel so my favorite cards are the ones using the destination stamps. My favorite has to be the gray and yellow, for the color scheme alone! Great new release! Love your hipster card and love card! Like your variety of creations. Especially like the NY stamp. Enjoyed a trip to NY quite some time ago, before 911. One fav was the hot dog from a street vendor cart. Have a BEE-utiful day! I am in love with the destination stamps. How fun. Great variety of cards you created! sweet sequin hearts on the love card. All beautiful cards. My favorite is the ‘love’ card. It’s very soft and pretty and just love-ly in every way. What fun you must have had! Don’t you just love a crazy creative day??? Thanks so much. Great cards! 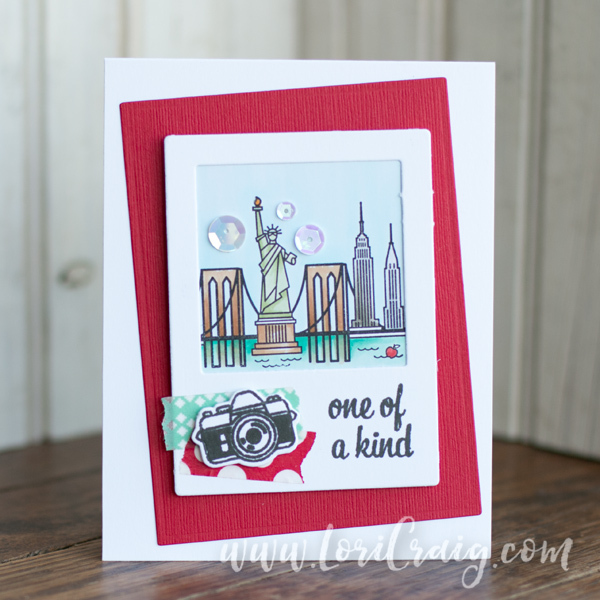 My fav is the love card – such a beautiful effect you have created and the New York card is a lot of fun! Thank you for the inspiration! All the cards are very nice. I really like the airbrushed ‘Love’. New York City is so fun and crazy busy… your card made me nostalgic and makes me want to buy this set! Loved all of the cards! Especially the Hipster at Heart one! Great job! Great Cards! Thanks for the ideas! Love your cards! It’s so hard to pick a favorite! Love how you used the camera in the foreground of your NYC scene. I also love the pop of color from the Washi tapes you’ve used! You made such nice cards…the New York scene was my favorite. Thanks for sharing your talent! I love your love card too! So cute! All your cards are awesome! Love the last one very much! such pretty colors in all of your cards – the “love” one is my favorite! Each card is picture perfect….what a collection you have created! I ADORE your Love card too! Fantastic! I just can’t get enough of those destination stamps! New York will be perfect in my scrapbook for a trip we took. Love the arrow/record card and also the NYC card. great cards. . . really like the NYC card and the record card. Fun, great cards! This is an awesome hop. Thanks for sharing!! Love the “prayers” stamp/die set! You were a very busy card maker! So nice. Same comment as above but with right email! Fantastic cards. Thanks for sharing. Love all the stamps on this release. Love these stamps! Your NYC card is beautiful! Those city stamps are so fun! I just LOVE your New York City salute! Beautiful and fun! Such sweet cards. Love them all! I love all the pattern you used on your cards but yet they’re not busy – they’re beautiful!! More great new stamp sets–love Hero Arts! And your cards are impressive. Love seeing these different sets!!! Great set of cards! Everyone is working this release. Amazing cards. Your cards are fabulous! Lots of different looks…I loved them all! Love all of your cards. Thanks for sharing. Have to say I’ve always wanted to visit New York!. The destination stamps are wonderful, and I love stamps on wood! 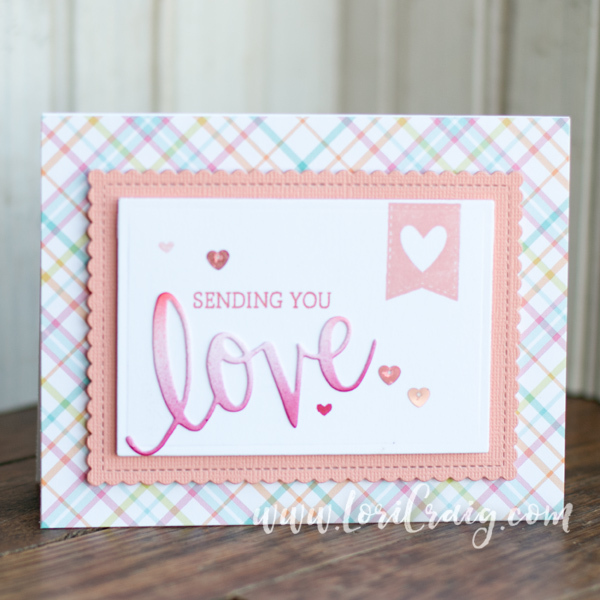 Fun cards–I love how you used airbrushing to color the love die! My teen age daughter and her friends would love those hipster stamps! Hipster hopping. I’ve always thought Hero Arts has been ‘hip’ with their stamp images and die cuts. Thanks for your inspiration! Wonderful cards. Love the release! Cute cards. I love the skyline of NY. Love the fun destinations. I would love to visit some of them. Very cute cards! Love them. Wow! My first time on your blog and I am awestruck with the diversity of your fantastic cards. Wow, you were busy! The first two cards are so cute and remind me of growing up in the 80’s. I love that sending card. So pretty! Cute cards — my fav is the Love card! What can I say? All are great cards! The hipster card is so so cute. Great cards and all are so different. Well done! Such fun and creative cards!!! Love the cut and stamp sets and beautiful fonts! I love the hipster stamp set! I have so many vinyl-loving friends (including my husband and kids) who would appreciate the records on a card from me- and with a variety of sentiments! The destination stamps are catching my eye, too . I may have to pick up a few for use in my travel scrapbookimg… the crafty wheels of possibilities are turning Thanks! What FUN cards!! So creative! Thank you for sharing such “hip” ideas! Old vinyl records takes me back. All your cards are fantastic. Thank you for sharing and being part of this giveaway. Cute cute cute …. what a fabulous new release from Hero Arts. Such fun cards! I liked them all but I think the sending you love card is my favorite. Thanks for all the great inspiration! Your cards are just so much fun! The NYC card is especially nice. Thanks for sharing! So many fabulous examples of so many terrific stamps and dies- I wish for them all! Adorable cards! My nephew would totally love the first one!! gotta say the Hipster card made me giggle a little! gorgeous! Think my favorite is sending love. So delicate and pretty. Very cool cards. Love the hipster one. What fantastic pops of color and patterned prints! I loved your use of layers and amazing contrast created in your cards! What a fun variety of Hero Arts Summer sets to boot! I love the coloring you did on the love die cut, Lori. And the plaid paper goes perfectly with it. Stitched borders are a favorite and I especially like the scalloped one here. Thanks so much for sharing with us and for participating in this fun hop. The Hipster card with the records is adorable… I also have a husband who has lots of vinyl records that he can’t part with. Adorable cards! Totally can relate to the vinyl, cassette tape, and 8-track (remember those?) dilemma and a husband who doesn’t want to let go. From one “hipster” to another – good luck with purging! Very fun cards. Thanks for sharing. Sadly, I remember 45 records. Love the card! Great cards! I have to get that NYC stamp! The more I see the City stamps the more I am liking them. Awesome cards but that NY one is my very favorite! Awesome. Great cards, Lori! That NYC stamp does look fun to color! Great cards! The release is so imaginative! Thanks for sharing. Love your cards, especially the New York one, since that’s where I’m from. Thanks for sharing! Such cute and fun cards!! I think your ‘Sending Love’ card is over the top awesome! I love your stellar card and the story that’s behind it. I can so relate… Still trying to sort through boxes with odds and ends from our move 4 years ago (ahem…). And your take on the NYC stamp is really cool! I love the polaroid theme that takes the skyline to another level! They’re all so fun, but the NY has to be my favorite! Wow…you have been busy and to good effect. All of these cards would delight any recipient. Lovely design and color choice. Very impressive. Stunning cards! Wonderful color combos!! Great cards. The record one makes me wanted to dance. And the Hipster one made me giggle. 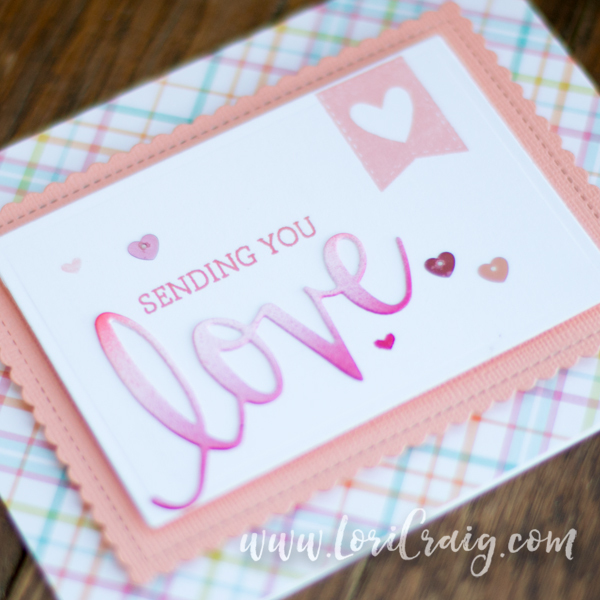 Love love love the pastels in the “Sending Love” card! Planning a trip to NY, so that card grabbed me as well. Thanks for sharing. The NY stamp is awesome! I totally agree that I love the LOVE card! So pretty and elegant. But the destination stamps will be great fun for lots of people. Your cards are all amazing. Beautiful cards. I can see those city stamps as a great 4th of July wish to friends who have moved in the respective cities. At my age, I have friends all over the states. Beautiful cards, the air brushed love is my fave! Ok, you’re officially a HIPster! LOL. Love your records (at first I thought they were bagels or donuts then saw the music notes). Your sweet “love” card with LF plaid paper is darling!! The NYC card is fab with the poloroid and camera! Thank you for all your inspiring creations — fun!!! Love the records. Great cards! the cards are all wonderful. Thanks for the chance to win~! Blog Hops are so much fun! What a great group of cards! I especially love the last two, the third one is just so pretty and I love the polaroid in the last. Oh my goodness. 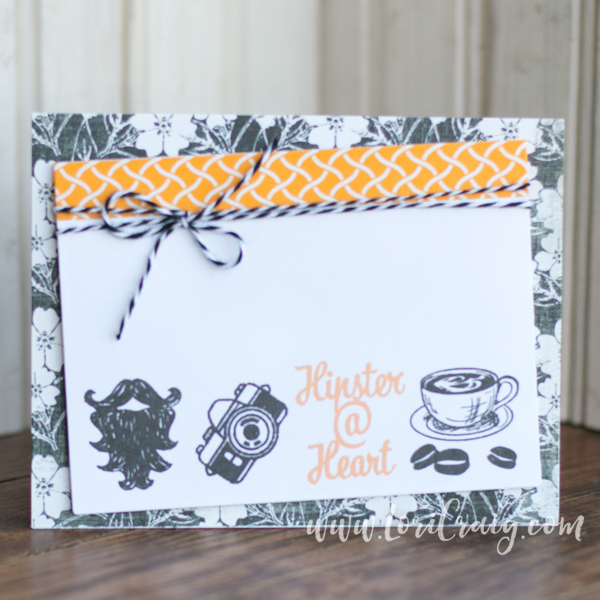 I love, love that Hipster at Heart stamp set! And I love your use of them on 3 of your cards. Wonderful! I’m loving those Destination stamps! The Hipsters are awesome also. I can totally relate to keeping all the cassettes & vinyl form the “olden” days. I still have boxes of them & can’t bear to toss them. All those memories that come to life with just one song!! Love your amazing cards! Awesome cards to show off these fun new stamps! I love the color tone of the LOVE card ! It is so clean and sweet ! And the destination stamps are just wonderful. It’s too hard to choose what makes favorite project is!! I like them all! Thanks for the chance to win! Such a fun release–great card designs. Geez these are great cards. I can follow your work now that I have discovered you. Great set of cards. Really nice variety. Fabulous cards! I really like the hipster at heart card. Very nice cars…love the NY one the best. Like your fun cards. I like the variety of all the cards on the blog hop. These are fun cards! Thank you for sharing! I love the NY stamp! My husband and I visited NYC – can’t wait to try out the stamp with our pictures! Thanks for the great ideas! Great cards!! Thanks for sharing! Wow’. All of these are fantastic! I can’t even say I have a favorite. Love all your cards! I think my favorite is NYC. Love all the elements and details you use in each of your cards. Thanks for sharing!! Thanks to HERO ARTS. Great release! I like the destination stamps too. Love your card designed with it. Love all the cards!! Gives me a few ideas and I’m excited to stamp again. Wow! Nice job!! Loving that ‘Hipster @ Heart! and of course the records – so retro! I love all your cards but that hipster one was so fun! I also like the Love card with plaid. Great cards, love the hipster and really like the new destination series stamps! I love all your cards! I have a record stamp. It has 3 records on it. I’ve been to NY a few times and even though it’s hectic and people weren’t that friendly, I loved it. I’m not sure I want to live their but to visit for a day, yeah. Love the hipster and the sending you love card, specially the pretty plaid paper. Nice job on everything! Lori, several lovely and cool cards. I love your hipster cards, especially the one with the records. What is standing out to me right now is how beautifully you colored and airbrushed that sentiment. Stellar! My daughter would adore that first card! Love all the new products! but Hipster is my fav! Wow, so many great cards, you have been busy. Love those fun “hipster” images. Thanks for sharing. Great new cards–love that hipster design! Wonderful cards. I especially like your New York “one of a kind” card. Beautifully done. WOW – these cards are STELLAR and outta this world!! 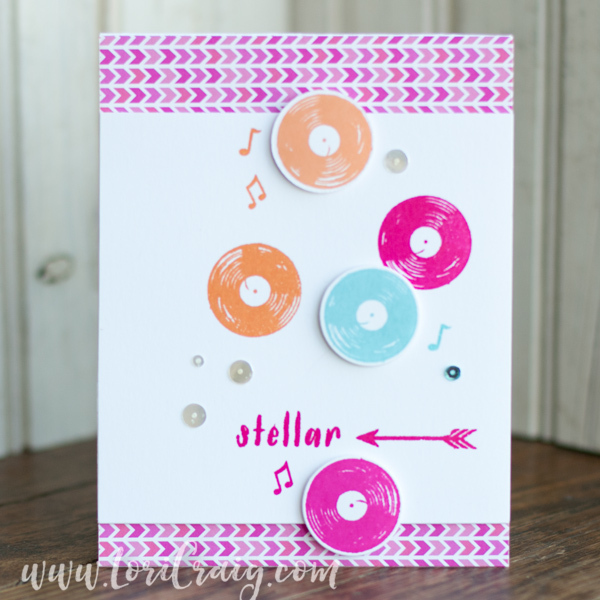 You shine in this area of cardmaking and I am so excited that I got to come to your blog and see these fabulous, amazing cards!!! How adorable! I can’t decide which card is my favorite, but probably the Stellar card, by a hair. These are all great. Thank you for sharing. lol hipsters! hope hero arts does even more cities and especially color layering sets, they are gret!!! Love your air-brushed die cut sentiment. Very sweet card! FABULOUS cards, ALL great designs and colours!!! My favourite is the DELIGHTFUL sending love. Great cards. So many great stamps. Thanks. Those new desination stamps are great! Your cards are fab! Fabulous cards – I especially love the NYC polaroid one! All your cards are really nice! That card with Hipster at Heart catches my eye. My favorite so far on the hop is by Kelly Rasmussen. Her card with the brass embossed flower is so great looking. Great, “hip”, cards! Love the colors.